No talk about how we got here, decades of Democrat policies that exacerbated the root issues of crime. Manipulation of crime. Benign neglect. Black misleadership. Regional exploitation of black suffering. Creation of environments where people are forced into survival mode… All ingredients that got us here,<br><br>”The assistant attorneys general were essentially deputized as federal prosecutors during a swearing in ceremony today, making them special assistant U.S. attorneys. Schmitt described the arrangement as “unique” and “unprecedented” “<br><br>Look at the accompanying photo… Not one black face. Notice they’re not pushing diversity or ‘intersectionality’. 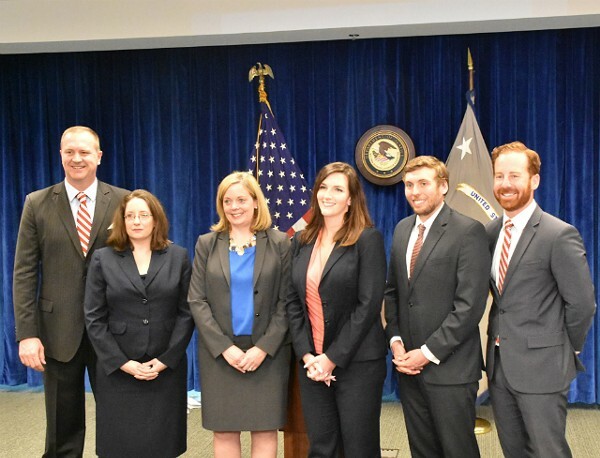 "The assistant attorneys general were essentially deputized as federal prosecutors during a swearing in ceremony today, making them special assistant U.S. attorneys. Schmitt described the arrangement as "unique" and "unprecedented" "
Look at the accompanying photo... Not one black face. Notice they're not pushing diversity or 'intersectionality'. Previous PostDied from leukemia. They’re saying diagnosed. Jail staff ignored his symptoms and rolled him into the court despite his deteriorating condition. Video confirms this. <br><br>The insult on top of this injury? His form of leukemia is considered ‘the most curable form of adult leukemia according to the Leukemia & Lymphoma Society’. – Post Dispatch https://www.stltoday.com/news/local/crime-and-courts/st-louis-county-inmate-died-of-acute-leukemia-medical-examiner/article_79acd22e-a290-54f7-8402-33097e8de173.htmlNext PostMalema CALLS Mnangagwa a SELL OUT for Compensating White Farmers!